Pretty, isn’t it? You can play with the dynamics using this applet. The trajectory will not pass through the same point twice, but is not completely random. Lorenz attractors have been used to re-sample sequences in the following way: Imagine you have a sequence of musical notes. Pick a starting point on the Lorenz trajectory and associate each note with successive points. Now you have your notes laid out on the Lorenz attractor so that for any point in the space you can find the closest associated note. If you start on the Lorenz trajectory from a different point, you can sample the notes in a different sequence. This sample will be different from the original, but tends to preserve some of the structure. That is, the Lorenz attractor scrambles the sample, but in a chaotic way, not a random one. As you can here, the overall structure of the song is preserved, but the variations are new. This happens because the chaotic trajectory sometimes follows a sequence of notes that was in the original ordering, but sometimes diverges, like a vinyl record skipping over a track. This technique has also been adapted for generating dance choreography (Bradley & Stuart, 1998). What I was interested in was whether this chaotic samping could explain some cultural phenomena. I was reminded of Soma, Hiraiwa-Hasegawa & Okanoya (2009)’s work on birdsong. Bengalese Finches learn their songs from multiple tutors, with the resulting song of the tutee being a mix of elements from their tutors. The diagram below shows two tutee’s songs (bottom) and how they were sampled from two tutors (top). This sampling doesn’t appear to be random, but there is mixing. Chaotic sampling could be a learning mechanism which produces novel sequences. Male songbirds must strike a balance between two aspects: Having a song that is similar to neighbouring birds is good for efficient territory establishment (see Soma et al.). However, because song complexity is a marker of fitness, the song should be somewhat different from competing males, too. That is, the best solution is a variation on a theme, not a radically different song altogether. Chaotic sampling provides a way of interpolating between structure and randomness. As a side-note, Lorenz attractors have been used previously to generate birdsong sonograms (e.g. Kiebel, Daunizeau & Friston, 2008). This captures the phenomenon of stretches of song from each tutor. However, the resulting string clearly does not conform to the constraints on the original finite state automata. That is, the song is successfully unique, but does not conform enough. 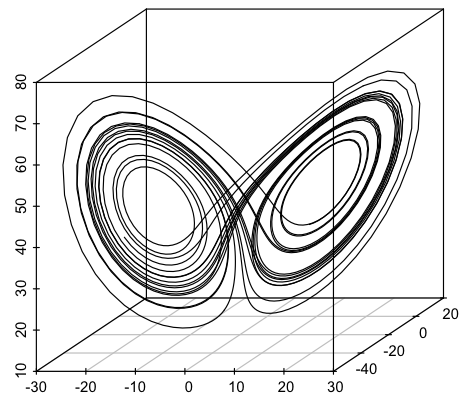 Perhaps the Lorenz attractor parameters were too chaotic. However, this is an intriguing model which I can’t resist extending into the iterated learning paradigm. 1) In an iterated chaotic sampling model (ICSM), to what extent does the structure of one generation conform to the structure of the next? Put another way, to what extent do successive generations understand each other? 2) Do strings generated by the ICSM become more structured over time? Does structure emerge that could be boot-strapped by a semantic system? I implemented an ICSM initialised with random strings with three possible ‘notes’. The model started with a random sample of notes plus a special ‘end of song’ marker. These were split into strings on this marker and the minimal finite state automaton (FSA) was generated that accepted those strings, a. This gave a number of states and a number of transitions. The original sample was then re-sampled using chaotic re-sampling. This produced a different set of strings, and a second minimal FSA, b, was generated. 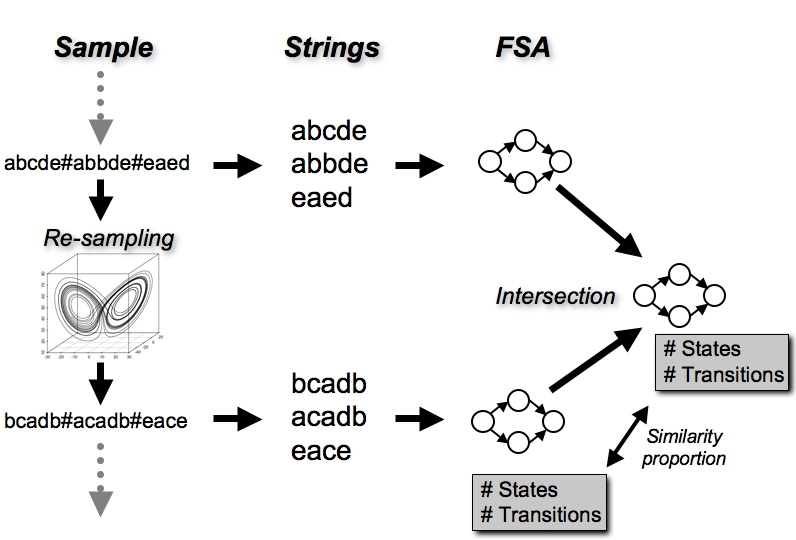 The minimal intersection, i , of a and b was calculated – this represents the smallest FSA, that accepts strings from both generations. Comparing the the number of states and transitions between i and b gives a measure of how different the structure of the strings has become after re-sampling. In other words, this measures how much the FSA has to grow to ‘understand’ both generations. If this proportion is low, it suggests that the structure of the songs are similar between generations. If this proportion is high, it suggests that the structure of the songs are different between generations. Below is the number of the states and transitions at each generation of FSA b. The number of note types (between 1 and 3) in each sample is plotted in green. The complexity of the FSA spikes periodically. 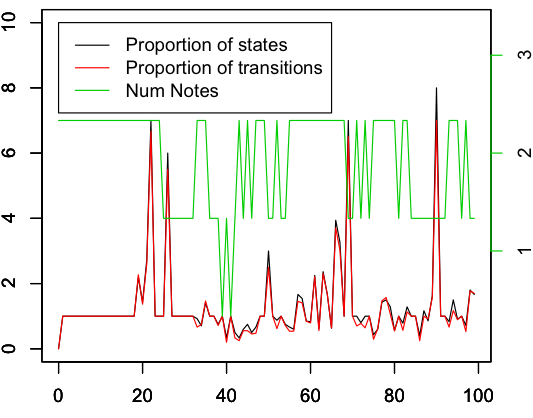 This may be due to the noise, since whenever a note is added due to nose the complexity increases (number of notes and number of transitions are correlated r=0.4, p<0.01). However, it suggests that a large amount of complexity can sporadically appear. This could be used for bootstrapping. 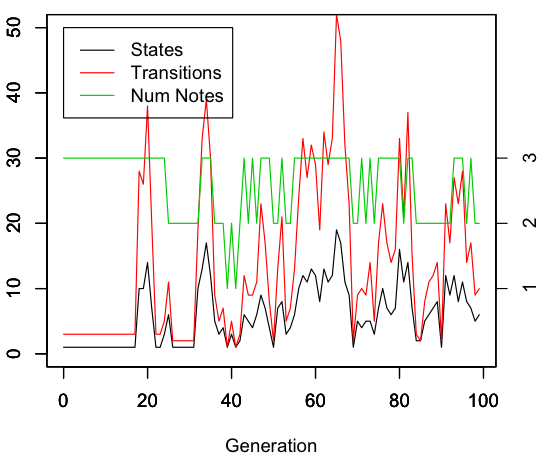 The graph below shows the proportion of similarity between generations, as measured by the relative proportion of states or transitions between b and i. The median proportion is low, suggesting that the samples from successive generations are similar. High fidelity transmission may be possible, then. The complexity increases as the similarity proportion increases, which makes sense. 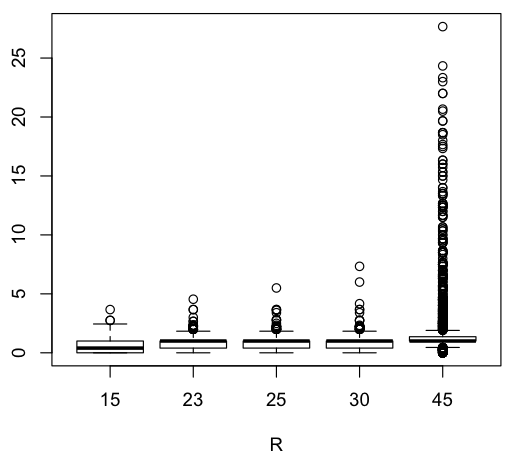 However, the number of notes is not correlated with the similarity proportion (r= -0.08, p = 0.4), suggesting that it’s not the number of notes that causes the peaks of dissimilarity. It would be interesting to look at the dynamics of the model further, including varying the parameters of the Lorenz attractor. Here’s how the similarity measure changes as a function of the Rayleigh number of the Lorenz attractor. This model could be applied to other cultural features, such as the evolution of music or dance or any cultural transmission where creativity is an essential aspect. It reminds me of the studies of cultural transmission of music currently being carried out by Keelin Murray (e.g. Murray, 2011), Tessa Verhoef (e.g. Verhoef & de Boer, 2011) and Lili Fullerton (e.g. Fullerton, 2011). This model may provide a useful benchmark. It may also suggest that the dynamics of creative cultural transmission are qualitatively different from communicative cultural transmission: Creative cultural transmission may be chaotic in nature, so have no simple universal attractors. 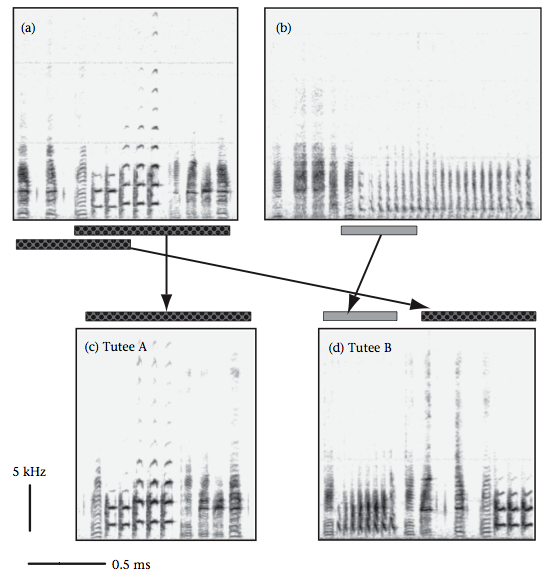 Verhoef, Tessa & de Boer, Bart (2011) Cultural emergence of phonemic combinatorial structure in an artificial whistled language, in Proceedings of the 17th International Congress of Phonetic Sciences (ICPhS XVII), Hong Kong, China. I’m not supposed to be looking at this anymore. I popped in to say thanks to Bill and check his reply. I can’t help one last comment. When I was talking to Bill I suggested running surface data into various wave/structures models and seeing what emerged- I said I think it’s most of what emerges going to be likely gobbledygook but it’s very interesting and a fun thing for someone not staking a career on it to consider the possibility. and asking if this is a dynamic in driving the evolution of birdsong and the mechanism underlying wider ‘cultural’ adaptions . 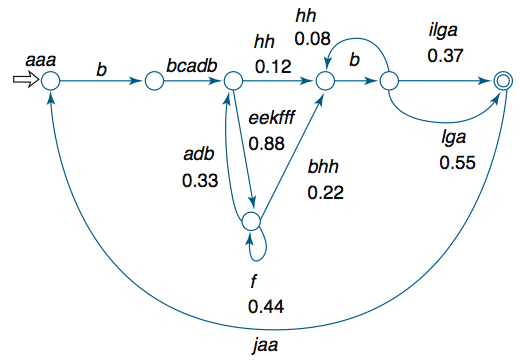 I’m not sure if this is any help to you I really like the idea of transcribing then shoving cognative-linguistic surface data into these kind of models and seeing what emerges. One last question and I don’t really know what he meant, someone quoting Tucker suggested that whilst LA’s were rigorous analytical tools but they gave (in 2002) rise to “pessimistic real world data”. Does that mean after everything has been run through an LA there is an expected slight differential in the outcome from the original? If there is have allowed for this when showing the rate at which adaptions occur? If it’s not the case, ignore what I’ve just written above, but it might be worth asking someone and checking it out. Very, very interesting stuff .Thanks. Sorry what I was trying to ask was what would happen if you took ten generations of real birdsong and measured the changes in those song patterns . Ie Songs 1-10 originated from recorded data. Then you ran from generation 1 through the parameters of the LA to 10. – What would be the variance from the actual recorded data and that predicted in the outcome of the LA? If differences do exist what are they? Is there any inherent factor in the LA that cause this difference , if so and this is removed how close does the new outcomes relate to the original recordings? Sorry about the confusion- it was just the phrase “pessimistic real world values” that got me thinking on this. If LA is totally rigorous and no inherent factors exist to cause difference , please, as I said before ignore this. This includes measures of the number of shared elements and transitions between Tutees and Tutors – much better measures than I’m using here (See Appendix B). This is a bit of light fun, but this guy was a walking LG who knew that acting out of standard parameters of variance could create a measurable response in his audience . Think about it. that standardized and measurable level of near spontaneous response in a high number of ‘processing units’ in the audience could not be arrived at by messages running around a classical neural network. There are too may variables to be processed. Gotta be something like a wave collapse.